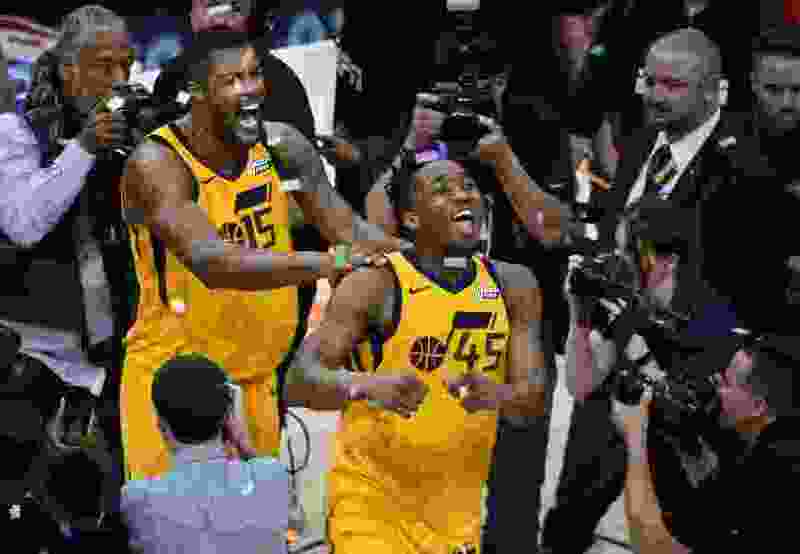 (Scott Sommerdorf | The Salt Lake Tribune) Utah Jazz guard Donovan Mitchell (45) and Utah Jazz forward Derrick Favors (15) celebrate the win over the Thunder. The Utah Jazz defeated the Oklahoma City Thunder 96-91 to win the first round playoff series, Friday, April 27, 2018. The Utah Jazz beat the Golden State Warriors three times during the regular season. They found a way to defeat Toronto and Boston. They split with the Portland Trail Blazers and were able to take three games from the San Antonio Spurs. In short, the Jazz managed to beat just about every top team in the NBA. Every team except the Houston Rockets, which were dominant against the Jazz during the regular season. Houston swept Utah, and none of the four games were particularly close. James Harden scored 56 points in one game. The Rockets turned an eight-point fourth-quarter deficit into a 20-point win in another. Luc Mbah a Moute dropped 17 points in a quarter during another game. Of course the Rockets were the best team in the league this season, a lethal combination of elite 3-point shooting and defense wrapped around the creation of Harden and Chris Paul. They were the one team in the NBA the Jazz couldn’t figure out. They will meet in a Western Conference semifinal, with Game 1 looming Sunday afternoon at the Toyota Center in ABC’s primetime slot. The Jazz will attempt to find a path to a win over a team that’s been as difficult to figure out as a Rubik’s Cube. In the big picture, the Jazz are playing with house money. Utah seemingly has done the impossible in the wake of Gordon Hayward leaving the franchise for the Boston Celtics. The Jazz found a way to have a good season and make the playoffs despite starting the season 19-28. They’ve replaced Hayward’s star power — and seemingly then some — with Mitchell, judging by his 38-point performance in closing out Oklahoma City in Game 6. They won their first-round series against a very good OKC team, one that probably is better than the Los Angeles Clippers team they took seven games to beat last season. Not many are going to give the Jazz a chance against a Rockets team that won 65 games this season. And Sunday figures to be a chore. The series against OKC left the Jazz exhausted, battered and injured. More than that, Utah will have less than two days as a turnaround thanks to the Jazz blowing Game 5 in epic fashion. Utah would have had a few more days of rest if the Jazz had finished the series Wednesday when they had a 25-point lead in the second half. So the Jazz figure to be a fatigued team Sunday. Plus they won’t have Ricky Rubio, who left Friday’s Game 6 with a left hamstring injury. He is out for Game 1 and likely longer. But Utah’s chances of scoring an upset to start the series will be diminished if their playmaker and floor leader can’t play or is limited in Game 1. The series against Houston will present a contrast in styles. Oklahoma City presented a challenge as an athletic bunch, one that plays inside the 3-point line. The Rockets are the most prolific 3-point shooting team in the league. The Thunder were led by Russell Westbrook, who scored 46 points but needed 43 shots to do it in Game 6. Harden is much more efficient and is the best in the league at seeking contact and drawing fouls. This is what the Jazz face. The circumstance nor the matchup for Game 1 will not be ideal for the Jazz. But Utah has come full circle from last May. Not only have the Jazz made the second round in consecutive seasons, they won’t have to go into the offseason wondering if they are going to be able to hang on to their best player. No matter what happens against the Rockets, the Utah Jazz already may have won. About the Jazz • Utah advances to the conference semifinals for the 16th time in franchise history. … Donovan Mitchell is the second rookie in the last 50 years to score at least 20 points in his first six playoff games. … Utah is in the second round for the second consecutive season. … The Jazz may be without Ricky Rubio, who left Game 6 with a hamstring injury. … The Jazz haven’t beaten the Rockets this season. About the Rockets • James Harden is the leading candidate to win the league’s MVP award. … Houston is coming off a 4-1 win over the Minnesota Timberwolves in the first round. … The Rockets have made at least 15 3-pointers in their last four games. … Houston forward Joe Johnson is a former Jazz player who was traded in February at the deadline.